In the early 16th century, Tzfat rabbi Rav Ya'akov Beirav attempted to reinstate "Smicha", ordination, to Rabbis of his time. True Smicha had been passed down, starting with Moses, from leader to leader, to each successive generation of Jewish leaders until Roman persecutions interrupted it. Subsequent Smicha was considered incomplete, as the original chain had been broken, and although Rabbis continued to receive Smicha upon their ordination, this smicha has always been seen as being partial. In Rabbi Beirav's day, the problem of Jews who had been forcibly converted to Christianity under the Spanish Inquisition was acute. Many Jews, once they had succeeded in fleeing Spain, wanted to be reaccepted as Jews, but the mainstream Jewish leadership refused to agree. Rabbi Beirav wanted Smicha reintroduced, so that the authority of Rabbis who agreed to accept these Jews back into the Jewish world would be unquestioned. Ultimately, Rabbi Beirav was unsuccessful at reintroducing Smicha, but his vision of inclusion was eventually accepted in the Jewish world. That vision of Jewish unity and acceptance is the driving force behind the Beirav synagogue, a little "shteibel" (small synagogue) so circumspect and unnoticeable that no one, viewing it on a quiet weekday morning, would ever believe that it is the Friday night Place To Be. Beirav Synagogue, built in the 19th century and named for Rabbi Beirav, follows the Carlebach style of prayer. This style of prayer was named for Rabbi Shlomo Carlebach, a New Age Rabbi well before the term was ever thought of, and Carlebach congregations infuse their prayer with joyous dancing and singing, often to tunes that Rabbi Carlebach composed. Throughout his lifetime, R' Shlomo Carlebach traveled throughout the world, bringing sparks of Jewish identity to thousands of unaffiliated Jews through song and storytelling. He believed that everyone should be welcomed and engaged in the service, and the tradition of song and dance interspersed with traditional prayers was a recipe for success for many people who found their way back to Judaism through Carlebach services. The Beirav synagogue is known throughout the world as The Carlebach synagogue in Israel. 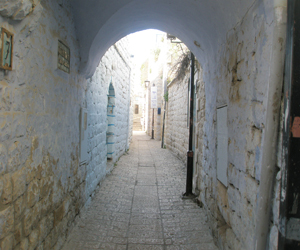 The little lane where the synagogue sits becomes packed on Friday nights, with a standing-room crowd not only inside the synagogue, but on the street outside. The tunes are entrancing, and the crowd alternates between black-fedoras and streimels (fur-trimmed hats of Hassidim), crocheted kippas, and men who are given a kippa at the door because they don't generally wear one. The women's side is just as mixed - secular mingle with ultra-Orthodox, everyone swept up with the music and fervor of prayer, each in his or her own way.